Here’s another quilt story. 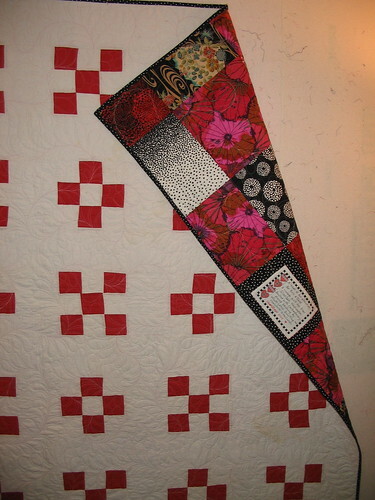 This one is about a vintage quilt top that my cousin Kris and I found in an antique store in Silverdale, Washington. She admired this pretty little red and white top, which was in very good shape, and for a good price, too. We didn’t buy it that day, but after she went home to the East Coast, I went back to the store and picked it up, intending it to be a birthday present in November 2008 — as a finished quilt for her newly redecorated home. Well it turned into a late Christmas present for 2008. Not exactly on time but that hardly matters. Any finished quilt is a good quilt! (I feel that way about stories and writing too). My cousin loves vintage textiles of all kinds but also favors the bright bold contemporary prints that I love as well. So I turned her vintage beauty into two quilts. 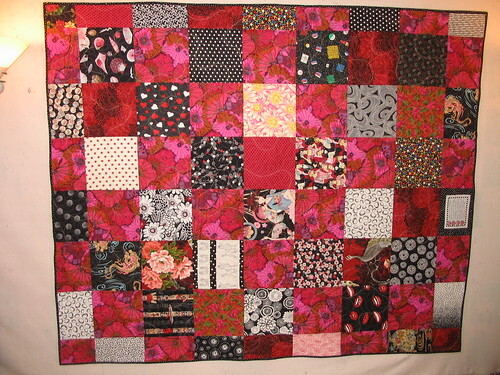 One side has the vintage top; the other, 10 inch squares of everything red, white and black I could find in my studio. Well, there were a few new fabrics in there as well. 🙂 If she gets tired of one side, she can flip it over and use the second side. Then it got a low-loft cotton batting, and bowing to tradition, an all-over feather pattern with a sort of modern meander. The thread is a pale pink; something that wouldn’t show up as too much contrast on the red, and not pop out on the white, either. And of course, I had to add a black and white polka dot binding. Just because. Kris has it on her purple velvet couch and promises to send a picture. I can’t wait to see it in its home environment! 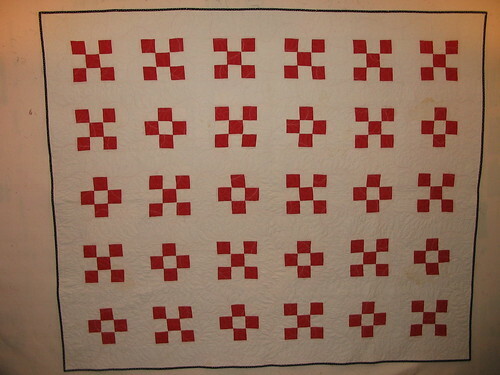 If you look at the top closely you’ll see that some of the nine-patches have 5 red squares, and some have 4, though there doesn’t appear to be any particular pattern to it. 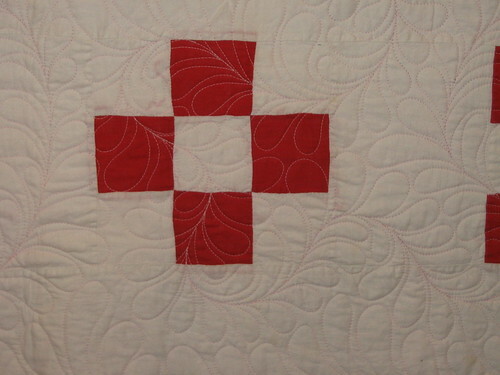 One theory is that the quiltmaker ran out of red fabric before she finished. That makes me even happier to think that the quilt wound up being finished, and being used and cherished in a loving home. A dream come true for any quiltmaker. So there’s lots of ways to make a quilt, or even to finish one. You can stay within certain fabric categories (Civil War repros, 1930’s repros, Asian, batiks, contemporary, blenders, kids’ prints, etc.) or whirl them all together if that pleases you. Personally I like the term ‘riotously scrappy’ from Bonnie Hunter; why use 3 fabrics when you can use 30? Or 300? That said, there is a certain appeal to this sort of vintage top, worked in only two colors. Simple and plain as they come. An austere beauty in its simplicity. I might never make this kind of quilt top, but I can certainly appreciate it. If nothing else for its ability to be a backdrop for bolder fabrics! There’s a current TV commercial that captures how I have sometimes felt as a wife and a mother: invisible. In the commercial, an invisible force moves a child back away from the television; it changes a diaper, it moves folded clean wash upstairs; it magically finds a sock that a husband can’t seem to place. The invisible, all-knowing, all-powerful force. For what an amazing and powerful influence mothers and grandmothers have over our lives, it is astonishing that more of us don’t know their names. For artist Kendra Allen, this became particularly poignant as she worked on gathering information for her grandmother’s names quilt. The quilt top itself she won at a raffle at a local quilting guild; perfect in its imperfections she wanted the quilting to capture a forgotten era. So she quizzed people for their grandmother’s names, surprised and saddened by the number of people who could not answer her question. After she commissioned me to quilt the top I joined her in the quest for names of our older generation, names that helped build a nation. I, too, was shocked by how many people simply don’t know who their grandmothers were. So how is it that we don’t know? How can we forget, or worse yet, not notice, the contributions of women without whom we would not — could not — be here? That seems a tragedy of the worst kind. Since my own grandmother Anne Chinnery Brady recently died in September, I’ve been thinking about ways to remember her and honor the impact she had on me. 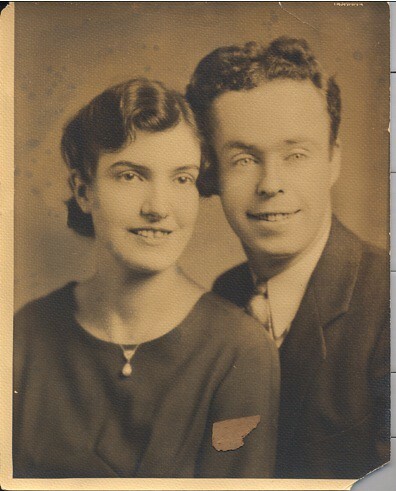 Her photo above, taken with her husband to be around 1934, reminds me of the optimism and innocence each of us begins with on the path of marriage and motherhood, before she had five children, two of which died before she did, and before her husband could die young, before seeing any of his grandchildren. Anne (born Anna) taught me to sew and knit and passed on her love of the textile arts, and I am deeply grateful for that. Every time I teach someone else, I am passing her gift forward. Glance at Kendra’s quilt in the finished quilts gallery on this web site. Think about your own grandmothers and what an impact they had on you. And leave your mark on your family and friends — don’t be content to remain invisible.